Nature of Problem: Disruptive behavior in class. Constantly yelling "All you base belong to us". When asked to stop he would ignore my request. He is guilty of insubordination. Recommendation of at least 3 days of out of school suspention. 3 day suspension seems a little harsh to me for quoting a video game. I've enjoyed seeing the creative answers students come up with but I am dismayed by your attitude toward these detention slips. Students should not be disrupting class -- sexually suggestive comments, crotch-grabbing, yelling, and such are NOT appropriate classroom behavior. 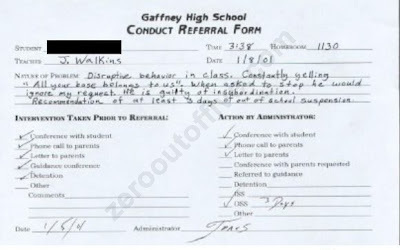 Check out DetentionSlip.org for more crazy stories from our schools. You wrote "out of school suspection" in the post, leading me to believe the teacher misspelled it. It is correct, 'tho, on the slip.